The Launcher is your business application catalogue – it's the little rocket icon at the top right corner of the header. It's a place where you can mark your own favourite applications and find and launch the applications when needed. The Launcher items are added by the company administrator through Launcher Management and everyone can expand the launcher and mark the ones that are most important to them as favourites. When you have marked your favourites these will be the only applications shown in the quick list. You can always add new applications to your favourites by either clicking the "expand' button or searching for any application. 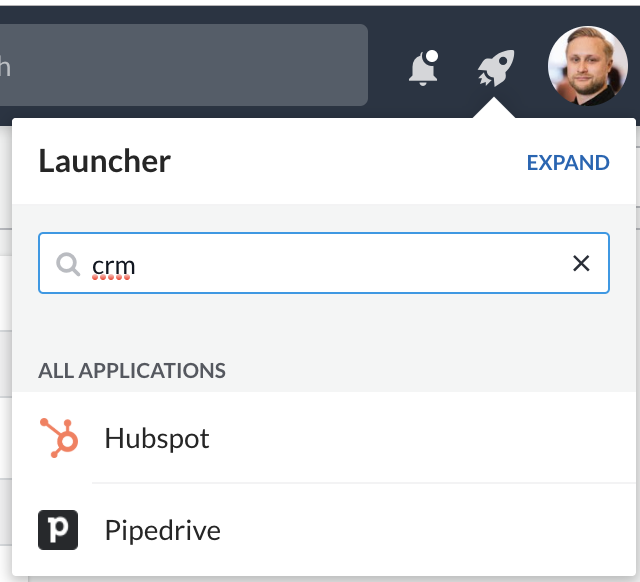 You can also search for applications based on the description that has been given to the application for instance below Hubspot is described as a CRM.